Eleven-year-old twins Seth and Sadie Fletcher are all set for a fun and relaxing summer in Frankfurt, Germany, where their father is a U. S. Ambassador. 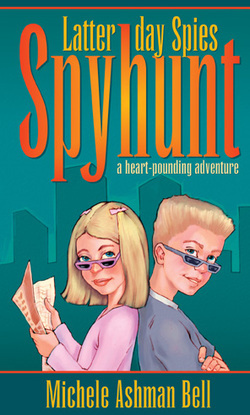 They are especially excited about having time to play their favorite game, Spyhunt, which takes them all over the city, riding busses, streetcars and subways in search of imaginary adventures. But for some reason, Seth and Sadie’s parents are more concerned than usual about the twins’ safety. To make matters worse, they announce that a blind boy named Fami is going to spend several weeks with them. The twins are afraid their fun will be over before it begins. Then they discover that Fami is a great kid who enjoys doing the things they like best. In the midst of their fun, the children spot a mysterious man who seems to pop up everywhere they go. Soon Seth, Sadie, and Fami will have an opportunity to play Spyhunt for real—in a dangerous game that puts their lives in jeopardy.